Our modern lifestyles offer little room for stretching or focusing on our bodies. Whether we’re working at a desk all day or standing on our feet too long, our bodies aren’t getting proper recuperation following demanding lifestyles. We believe that chiropractic care is one of the best ways to achieve the all-over body wellness that we desire after a long taxing day. Additionally, our team can supplement chiropractic care with simple stretches to deal with common complaints we see on a regular basis in our office. One of the lesser-known muscles that causes a lot of pain and discomfort in many people is the psoas muscle. This muscle extends deep beneath the abdomen across the lower back and around the spine. The disruption of this muscle causes lower back pain that can be unbearable. Usually, the pain will let up throughout the day as the muscle is lengthened. Sitting at a desk or sleeping in curled up positions causes the muscle to shorten. Extending the muscle is what causes pain, especially when the muscle isn’t being properly stretched and cared for. As it gets worse, this pain will last all day and start to affect the hips and body alignment. Our posture is deeply tied to this muscle, so maintaining proper posture is the first way to improve. The best way to help this problem is by visiting our practice for effective chiropractic care regularly. We use specific, scientific chiropractic analysis to assure your hips and pelvis are aligned, thereby making sure that the psoas muscle has minimal stress, if any at attachment and insertion points. Fun fact: the psoas muscle is one of the only muscles to attach to the vertebral discs in the lumbar region. When chiropractic adjustments are delivered to the lumbar region and pelvis, we are directly impacting the psoas muscle. The best way to release the psoas muscle at home is through stretching the knee and back. 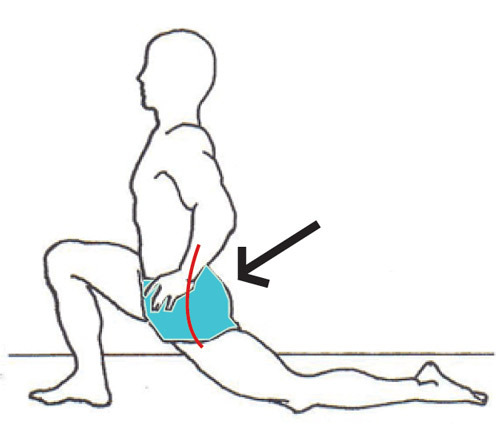 To perform this stretch, start by kneeling down on the floor (use a yoga mat or something with a little cushion). 1. Get in the position of kneeling down on one knee. 2. Bring the other leg up with the foot on the same side resting on the floor. 3. Bring the hips forward and down, in a lunging position. You should feel a pull and tightening in the hip and low back region. 4. Hold this for 15 seconds and repeat on both sides for 3-5 times. 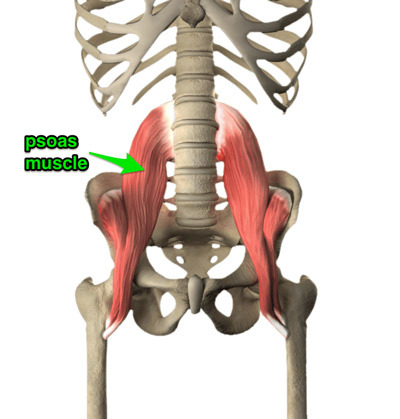 As a muscle that is so widely used, the psoas muscle also has deep ties in yoga training. There are also a myriad of yoga poses that can help relieve this muscle. Lying on your back and gently raising each leg at a 90 degree angle can stretch the psoas and hamstrings down your legs for a deep stretch to help reduce any tension buildup in the leg muscles. Always remember to go slowly and never go further than what feels comfortable. Leave the deep stretches to the professionals who know how to gently loosen your muscles. As always, remember to take nice deep breaths with every stretch and pull. Do you know someone who sits in front of a computer all day or has bad posture? Compass Family Chiropractic is passionate about spreading the knowledge of how amazing our bodies are with just slight alterations to day-to-day activities and keeping your nervous system free of misalignment and nerve interference. Our goal is to assure that you are functioning optimally, without pain and stiffness, thinking clearer and feeling great through specific, scientific chiropractic care. We look forward to working with you and your loved ones! We can’t stress enough how important the psoas muscle is in relation to the overall postural stability of your body! Contact us today to book your visit.